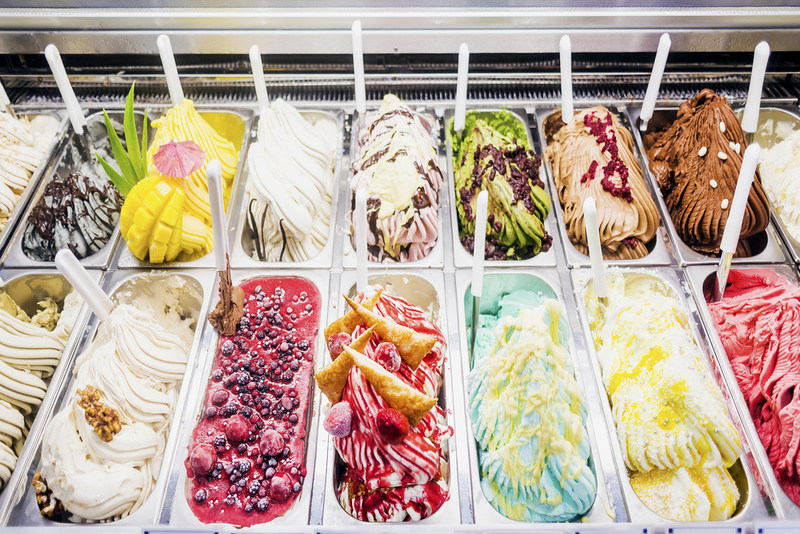 If you are a part of the center of India, Delhi and the NCR region around it then we have mentioned some really great Ice Cream Parlours for you. Summers have finally arrived and no one can deny the fact that Ice Creams are everyone’s favorite in this season. Although, there are so many Ice Cream Parlours/Joints in Delhi/NCR region that it is pretty difficult to decide(at least for an Ice Cream Enthusiast). Although, what confused you? Is our problem to solve. Also, then taking a step ahead we have mentioned some really great Ice Cream Parlour in Delhi/NCR. The great thing about these parlors is that most of them are available on online food service like Zomato(#HomeDelivery). Therefore, let’s dive in. Hauz Khas is the center of Partying in Delhi and if by any chance, your sweet tooth is craving a scoop of ice cream then Gelato Roma is the place. It is a small stall in Hauz Khas that has a range of exquisite ice cream. The place is a must visit if you are an ice cream lover and roaming around Hauz Khas. The next time you are visiting DLF Mall of India in Noida and feel like having a mouthful of great Ice Cream then this is the place. Oh So Stoned! Is located in the Food Court of the mall. The Franchise runs great offers every now and then with your favorite ice cream being served. It is truly a treat to visit this place. A perfect place to be during the evening walking around while Emoi’s Ice Cream in your hand. The USP of their ice cream is the shape of ice creams they have. It could be a cake, a paw, or maybe a heart with lots of colors and taste that melts your heart. Therefore this is one place to hit if you are on a casual outing. The StickHouse is famous for one thing, Stick. Yes, each and every offering that they have for you is basically on a stick(at least the ones that people like and they recommend). They have some really great Gelato’s as well as other offerings in their catalog. This won’t surely be a visit that will go to waste, therefore, just try them once. A little heavy on the pocket but is another great franchisee of Whipped located in Defense Colony. The place is simply exquisite with great ambiance for you. At whipped, you can have a variety of ice creams although it’s cheesecake is pure love. Do visit the place if your sweet tooth is craving and you are somewhere in the proximity. If you don’t know about Baskin Robbins then you may probably be living under a rock. This is by far the most well-known Ice Cream Parlour or Joint available in India. One of it is available in Greater Kailash although anywhere you go they have standard offerings. If you are a newbie to this whole Ice Cream Parlour thing then Baskin Robbins is the place where you should start. Well, this may not be a proper Ice Cream Joint because you can get sandwiches, Burgers, and Fries in the place. Although, It is not less than any Ice Cream Parlour. They got a menu card of two pages with one page dedicated only to Ice Creams. If you wish to have something basic, well, they got you covered otherwise they have a wide range of some exquisite Sundae’s to melt your brain. You also got some of the best flavors with waffle. Another great place in Delhi to relish Ice Cream. The place is located in Green Park which is near Hauz Khas. The place has some really mind soothing offerings to cater to your sweet fantasies. Be it a Sundae or an Ice Cream Sandwich or maybe Ice Cream with Waffle, they have it all to savor by you. It is a small place located in Sector 50 of Gurgaon. The place has a really great ambiance and is literally something that you would like to experience. They make your ice cream in front of your eyes. Also, they have many great flavors for you to try. Therefore, at least give them a go for just once. It is a small joint or Kiosk available in Saket. The place has truly redefined the meaning of the word Ice Cream. They have so many great Ice Creams with such great flavors that you will drool to the floor once you had a scoop. This is a mecca for all Ice Cream especially if you wish to have something of international standards. The only con about MovenPick is that it is very expensive. First time Online shopping is as crazy as war!! Read here to know why..